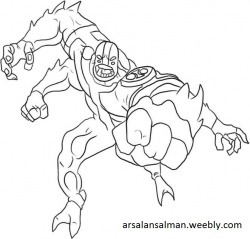 Four arm ben 10 - Welcome to Arsalan Website. 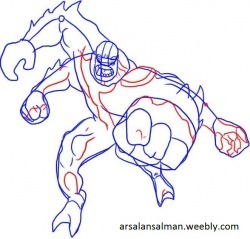 Step 1.In this first step what you are going to do is draw out the guidelines and shapes to form a frame for Four Arms. Start by drawing out the shape of his head which is a small circle, then draw facial guidelines in the middle. Now move toward the fist that comes at you and draw a boxed shaped circle as shown and begin to draw in the lining for a few of his fingers. After that you can draw out the lining for his body like the torso and the legs. From those shapes draw out the guidelines as shown. Step 2.Here you will start to draw out the expression on his face which includes drawing out his eyes and mouth. You will also have to draw out the shape of his head as shown. 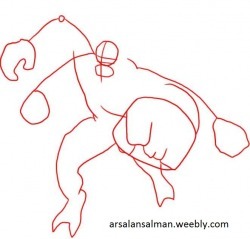 Move to the left and begin drawing out the shape of his upper left arm which looks like flames and then draw out the shape of his lower left arm with the fist and all. Now shape his left leg better and sketch in the muscle definition as you can see. Draw in the knuckles on the right fist and sketch in the details on his right arm and foot. Step 3.As you can see you are almost done. You will now start to draw out the detailing for his uniform on the shoulders and chest. After that define the left arm and leg with more muscle definition. Draw out the lower right hand as shown and detail his right fist some more. After your image looks similar to the one above move to the next step. Step 4.This is the last step where you will be drawing and sketching. What you are going to tackle first is drawing out the fingers and uniform lining ion his left upper arm and hand. After that you can move to the right and draw in the uniform emblem on his shoulder and sketch in a few detail lining on his arm as well. Erase all the visible guidelines and shapes that you drew in step 1. 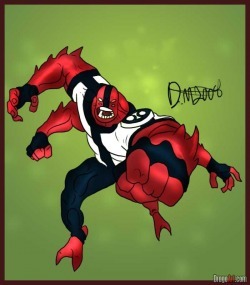 Step 5.This is what your Ben 10 alien should look like when you are completely done. All that is left to do is color him red and add him to your collection. 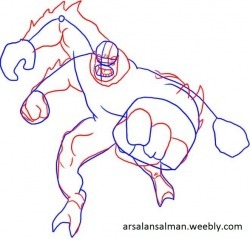 That will do it for this tutorial on how to draw Ben 10 aliens Four Arms.